Pensions are the biggest pillar of the Italian welfare system. Like in many other European countries, the pension systems has been undergoing a series of reform since the 90s’, to ensure its sustainability threatened by population aging. The reform process has however been quite socially painful, and scarcely understood and shared by the majority of the population, as a result both of political shortsightedness and of distorted representation by the media. This book tries to fight the common clichés that have been dominating the public debate on pensions, and explains the reasons and main issues behind public pensions, as well as the features of a good pension system. It also analyses the motivations and key elements of the reforms, without neglecting their social perspective. 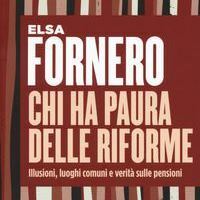 In the final chapters Elsa Fornero tell us about the Italian 2011 crisis and the subsequent reform process enacted by the Monti Government in 2011-13 – she was Minister of Labour and Social Welfare and played a key role in the introduction of both the pension and labour reforms – highlighting the most important achievements of the pension reform, and warning against dangerous stops or U-turns.